FMEA FAQ: Some Answers to Your Questions After Our Webinar! 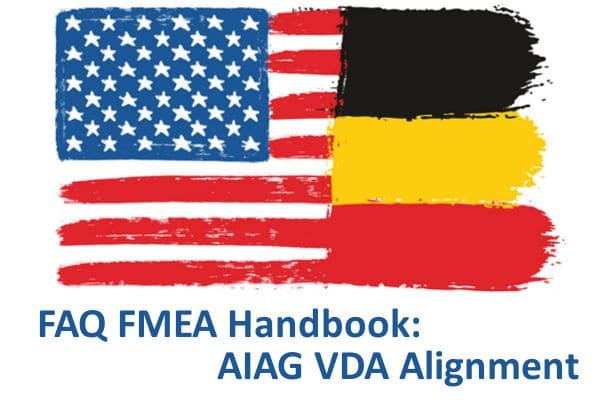 You were about 110 people to register to our webinars focused on the AIAG VDA handbook for FMEA. After the presentation, you had a high number of questions and it wasn’t possible to answer them all. This article aims to answer to these questions… and give you the state of information we have in July 2018! When Will The Next FMEA Handbook Be Released? After the publication of the “yellow print” in November 2017, more than 4000 comments and questions were addressed to the AIAG and VDA organizations. The final release is postponed from May to September. The implementation of these new recommendations shouldn’t impact your program until the end of the 2018 year. But as soon as the release will be published, it will be necessary to anticipate your transformation: method and software training, update of the new parameters, settings of the software. What Is The Place Of Functional Analysis Of Need? On the design side, the new manual integrates a functional analysis step. The functions are identified for each component that makes the bill of materials. This easy approach helps you to work on the reliability of an existing solution. It is also interesting for the system engineering. However, this approach is limited, especially when the technical solution is not already defined: innovative projects or pre-project. So we advise to keep a functional analysis of the need. For all our customers using the “NEED” software , it will be always possible to structure a functional specification with the functional analysis of the need: life phase identification, interactors, APTE’s graphical tools, characterization, value analysis. When deploying the 6 steps approach of the new handbook, it will be possible to assign these functions to the related systems. For the customers who wish to work directly in the software FMEA, it will be possible to create the functions from the tree structure. How To Highlight Special Characteristics in the Drawing If They Are No More Displayed in the Design FMEA? The yellow print of the FMEA handbook doesn’t include a classification symbols column. It is no more a goal of the Design FMEA. We think that the special characteristic management can be identified and tracked through the functions relations to be implemented. (chap 2.3.7). Anyway this topic is questionnable and we can hope a clarification in the next version of the handbook. Will the FMEA Review Be Included in the New Version of Robust Engineering Suite? Our software have always been developed to assist you in the implementation of the methodologies. The assessment criteria of the reviews will be taken into account in the functionalities of the FMEA software. Is the Reverse FMEA Taken Into Account? The yellow print doesn’t refer to the reverse FMEA approach. We hope it will be integrated in the final release. Will the New AP Matrix (Action Priority Matrix) replace the CSR (Customer Specific Requirements)? CSR (customer specific requirements) have to be considered and it is a requirement of the IATF. It will be interesting to follow how the car makers will adapt their CSR with the new recommendations of the AIAG VDA handbook. How can we anticipate this challenge and when will the new version of Robust Engineering Suite be released? Our IT team is involved in the development of the new functionalities. The planning will be consolidated as soon as the final version of the handbook is released. If you are interested, you will have to upgrade the skills of your team and the parametrization of the software. Training related to the new recommendations and new software version. The transformation and the compliance of your concerned FMEA. The concerned FMEA are those from the new projects and the generic studies. If you are not interested by this new handbook, it won’t be mandatory to install these new customizations. Versioning is a major feature of our FMEA Software as it enables to kow who did a change, from what part of the study, when and why. It will be of course maintained as it gives a strong time saving during the life of FMEA studies. The multilingual data management, the principles of libraries and generics will of course also be kept. We ensure the compatibility of all your existing studies.